Order your ADJ AC3PDMX 3 Pin DMX Cable from AMS and enjoy Fast & Free Shipping. Get the Best Deal with our Lowest Price Guarantee & Great Customer Service! The American DJ AC3PDMX10 3 Pin DMX Cable provides reliable, high performance signal transfer for lighting installation, mobile lighting setups and more! American DJ uses high quality components for long life even when used frequently. 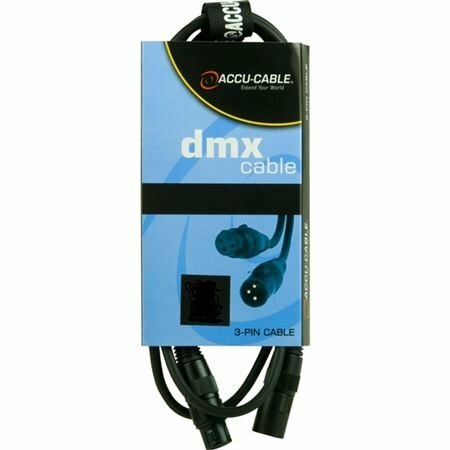 Features of these DMX cables include 22 AWG stranded tinned copper conductors, polyethylene insulation, polyethylene inner jacket, Duofoil (100-percent coverage) and cotton plus a tinned copper braid shield (85-percent coverage), PVC jacket. Well worth the money. They allow me to do uplighting using fewer lights using my DMX controller. Perfect fit. Well worth every penny. I bought 20 for dmx purposes and couldn’t be happier with my purchase! good construction of cable, no signal dropping, highly recommend. Works as it should. Easy grip outer shielding. Comes down to 5 ft.,needed 3 ft. but that's OK.
Looks great, Works great! Comes with a Velcro tie!